SINGAPORE - Singapore's non-oil domestic exports (NODX) shrank by a worse-than-expected 9.9 per cent in January from a year ago, the third straight month of contraction, as a slump in demand from China deepened and shipments to the United States turned negative. As with December's unexpected 7.2 per cent fall in NODX, much of the blame lay on the contraction in shipments to China, which was Singapore's largest export market in 2014. But this time, exports to the US, which had been holding up, also fell. Economists polled by Reuters were expecting January NODX to fall 7.4 per cent from a year earlier. 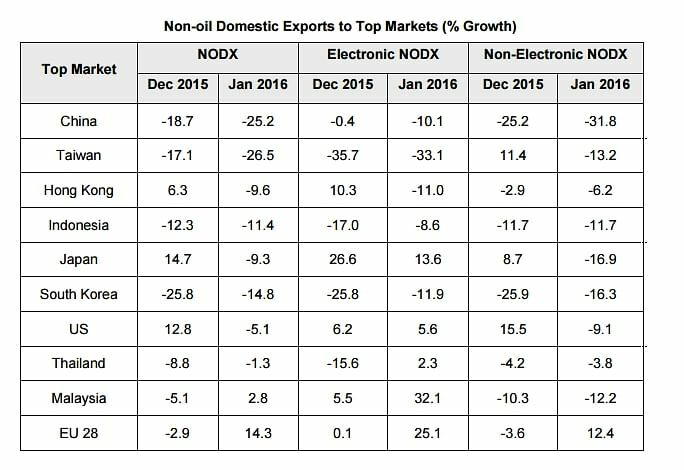 Both electronic and non-electronics exports slumped as shipments to all of Singapore's top 10 NODX markets, except the EU 28 and Malaysia, contracted in January 2016. The top contributors to the decline were China, Taiwan and Hong Kong, said the report from International Enterprise (IE) Singapore released on Wednesday (Feb 17). On a month-on-month seasonally adjusted (SA) basis, NODX grew by 0.7 per cent in January, in contrast to December's 2.6 per cent decrease, due to an expansion in electronic exports which outweighed the decline in non-electronic shipments. Economists polled were expecting a 1.8 per cent month-on-month rise in NODX for January. On a SA basis, the level of NODX reached S$12.7 billion in January 2016, higher than the S$12.6 billion registered in the previous month. NODX to China tumbled by 25.2 per cent in January, worse than the 18.7 per cent fall in December. Shipments to the US, Singapore's third-biggest export market, fell by 5.1 per cent compared to a 12.8 per cent rise in December. 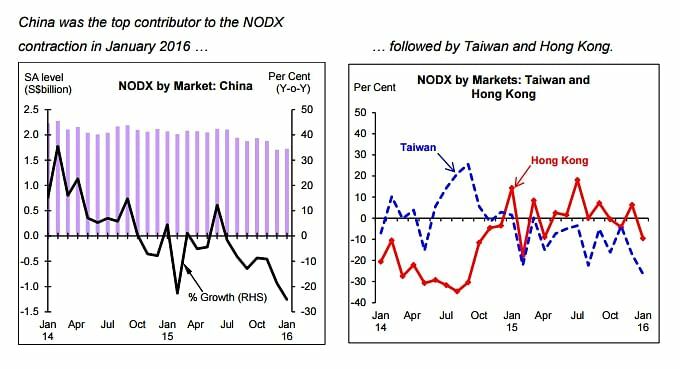 NODX to Taiwan shrank by 26.5 per cent after falling 17.1 per cent the previous month. 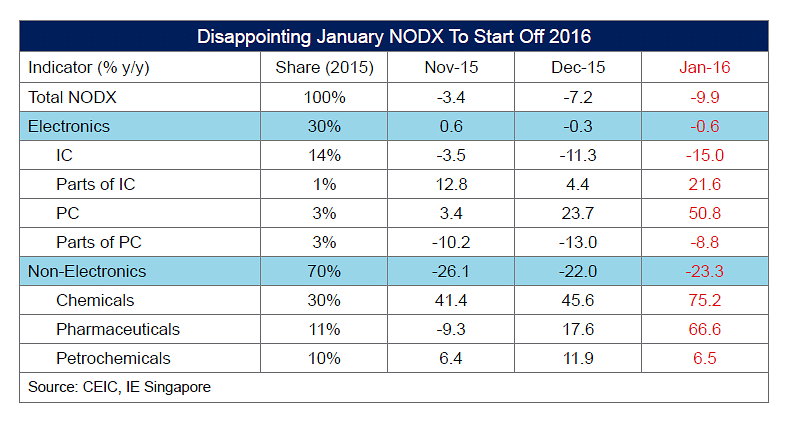 NODX to Hong Kong decreased by 9.6 per cent compared to the 6.3 per cent rise in December. A separate business survey showed earlier this month that activity in Singapore factories contracted for a seventh consecutive month in January as weak global demand continued to weigh on new orders. The worsening export slump may raise expectations of further policy easing by Singapore's central bank at its scheduled policy review in April, analysts say. On a year-on-year basis, total trade - which includes oil and gas products - contracted by 14.4 per cent in January, following a 8.4 per cent decline in the previous month. Total exports decreased by 15.1 per cent, after contracting 6.4 per cent in December, while total imports fell by 13.6 per cent after a 10.6 per cent decline the previous month.